We offer you a range of features to meet virtually any ITSM or service desk need. Start at a level that suits your maturity, and grow at your own pace. 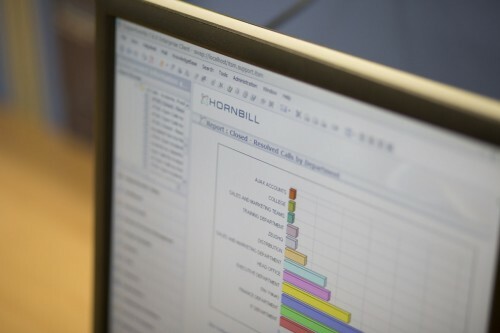 Hornbill ITSM solutions are designed to cater for all levels of IT Service Management maturity. Extensive support for 10 Pink-verified ITIL processes ensures support for both your current and future needs. Deliver a truly customer-centric experience by giving front-line operatives a better understanding of the roles and responsibilities of their customers. Run multiple service desks across different business functions, all on a single platform. Avoid duplication of effort, reduce hardware and software licensing costs and decrease the amount of time IT spends supporting service desk users. User-friendly design enables rapid deployment and adoption of self-service, automation, proactive problem management, innovative knowledge management and other key features. Choose the deployment model that suits your business today, and get the flexibility to change from one to the other later. Windows client or web client – chose either or both. We support your browser of choice, whether it’s Chrome, IE, Firefox or Safari. Our Human Resources and Facilities Management Service Desks maximise efficiency and ensure best practice throughout the business, helping your address service quickly, comprehensively and consistently. Get up and running quickly with minimal need for professional services. There's support for 10 Pink-verified ITIL processes, set up and ready to use "out of the box".